If anyone was ever afraid to dream a dream, you should check out this clip on Youtube. 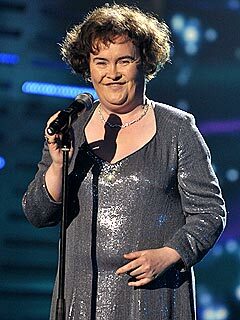 It is the clip of Susan Boyle’s breakthrough performance where she stunned the judges and the audience members of Britain’s Got Talent! She knocked another one out of the ball park with her rendition of ‘Memory’ from the musical cats. Check it out. If you and your dreams have been silenced due to naysayers, check out these video clips, and never be afraid to dream big. She was almost 48 years old, unemployed, and because she never stopped believing in her dream, became an over-night sensation. Let’s keep our fingers crossed that she gets to live her big dream – singing in front of the Queen. This has been my “Wow” book! 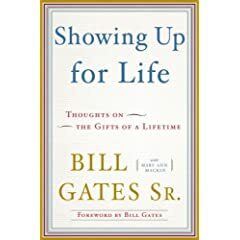 In this book, Bill Gates Sr. talks about showing up for life… being there, volunteering. He talks about hard work, and radical generosity. Bill Gates Sr. is 83 years old, and says he is priviledged to be representing and running the Bill and Melinda Gates Foundation. He says he never imagined he would be working this late in life, or that he would be enjoying it so much. He says he gets up early every morning because ‘he enjoys it’, and he thinks it suits him much better than lying on a beach. As you may be aware, the work that Bill and Melinda Gates have done has garnered them the Time Magazine ‘Persons of the Year Award’, sharing the award with Bono in 2005. Read about the fantastic work these three people do in this article. But first, pick up this book by Bill Gates Sr. It will move you. And hopefully, it will inspire you to get out and do a little bit of volunteer work or just to ‘show up’ for the people you love. 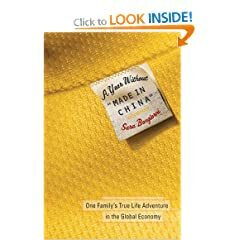 Tom Brokaw called the book a “Gift of Great Value”. I couldn’t agree more. That’s enough reason to say ‘Thank you Mr. Gates for writing this book”. I loved it. I want to do more. We live in the age of information. It is more easy to gain access to information and to share it than any other time in history. Then why are people getting sick, and some dying, from Chinese made products? Let me say right here that I know not every product made in China is faulty, poisonous, or tainted. But we are buying baby food, pet food, toys and now drywall, that are not superior products. 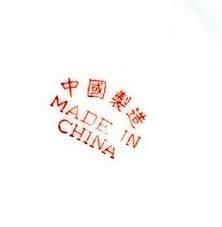 Let’s not assume China has the same ‘standards’ for safety and quality that Canada has. Pay attention to what you are buying everyone.